And we're all hoping the new color isn't a reflection of how they feel after coming oh so short last season in winning the Premier League and the Champions League. 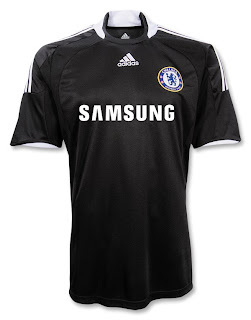 Whatever the state when the adidas designers threw this black kit together, surely things are looking up at Stamford Bridge after the recent hiring of Felipe "Big Phil" Scolari - the same Scolari who has Portugal as the unnanimous favorite to bring home the Euro 2008 trophy. Fans should like this away kit much better than the eye-sore yellow from last season. Man, did I hear some complaints about that one. So, maybe it's a bold statement of how much they want to get over the hump and bring home some silverware.